SYRACUSE – The success of a start-up is fostering the birth of another good idea. The institution of Unified Track and Field at the IHSAA level in 2014 was a curious but anticipated one. Locally, Warsaw stood tallest as state champions in its inaugural season and went on two years later to win another state title. Since then, Elkhart Memorial won the latest championship back in June, giving the area three spring championships in Unified’s five years. 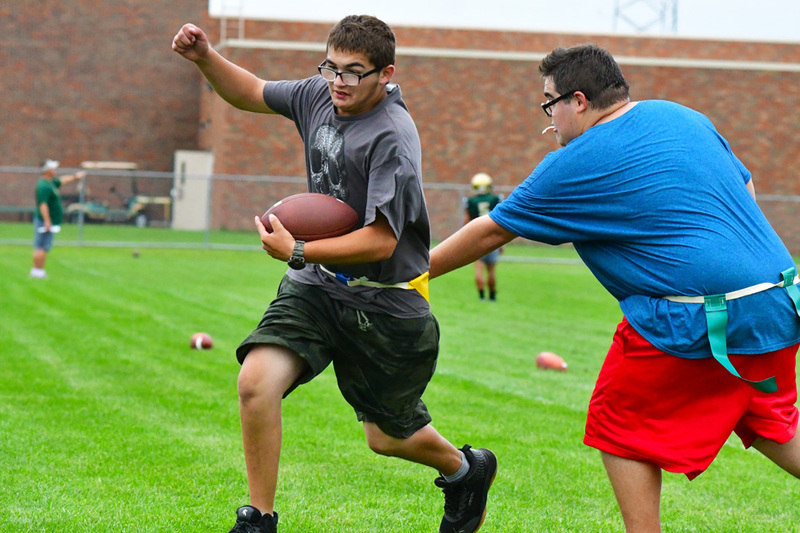 Now, high schools will take their turns with a fall variety in the introduction of Unified Flag Football. Kosciusko County will have three teams involved in the 28-team start-up this fall. Outfits from Wawasee, Warsaw and Tippecanoe Valley all will take part in the latest offering from the IHSAA. The structure of the flag football will resemble that of what USA Football is doing with the youth game. In unified flag football, at all times no more than three ‘athletes’ can be on the field at one time with no less than two ‘partners’. Both boys and girls can play, and there is no limit to be part of the active five on the field. Unified Track, for those unaware, was created to give those with special needs an opportunity to compete in high school athletics. Intertwined with ‘athlete’ peers, those with special needs are able to compete in sprints, throwing and jumping events in track. The same will hold in flag football, where anyone can compete at any position. Teams will play on a 60-yard field in two 20-minute halves. Scoring will have touchdowns count as six points, and extra points will have one-point tries start from the five-yard line and two-point tries start from the 10-yard line. Extra points will be run like two-point conversion tries in regular football, one play to get into the end zone. “At Wawasee, we have a lot of interest in the new IHSAA sport,” said Wawasee head coach Andrew Wilson. Preseason turnouts had the Warriors with nearly a dozen players at practices. “I think this is mainly inspired by the popularity and success of our Unified Track team in the spring. The only struggle we have had is finding athletes that are not already participating in a fall sport. I am very pleased with the turn out we have had so far but we are always looking for more to join. Warsaw, which has seen the most immediate impact through Unified with its two track championships, is seeing a similar interest in football. “Recruiting has generally been positive,” started Warsaw head coach Sam Smyth. “Some of our kids were concerned that there may be tackling or contact, but after some reassurance we were able to sell it. The only real issue was the short time frame we had for when we were going to start practices. Tippecanoe Valley, which has added a Unified track program in the past couple years, is excited to add football to its athletic department. Led by longtime Valley football coach Jeff Shriver, the newest team at Valley has 12 members and is ready to go. The IHSAA will format it much like the regular football tournament, gridding up 28 teams into bracket play. Those eight sectional champions move onto the regional, where the final four winners will come together at the Indianapolis Colts training facility for the state championship. The state will even have a pairings show in Indianapolis on Sunday night to break down the tournament matchups that begin Sept. 29 around the state. Wawasee v. Goshen 5 p.m.
Warsaw v. Goshen 5:45 p.m.
Wawasee v. Warsaw 6:30 p.m.
Warsaw at Wawasee 6 p.m.